Welcome to our home, O'ahu-'the gathering place'. It's like living in New York High rising above the ocean. We know you will enjoy your stay here on the bustling city beach teeming with life. We looked for years for the perfect blend of beach, city, nightlife, shopping, jungle and exotics. For us it is Waikiki Beach. Why? LOCATION LOCATION LOCATION. There are many activities that will keep your party busy or relaxed during your stay. Everything is at your fingertips. Walking is our favorite pastime but if you need a rental car just go down stairs to lobby. Cooking? Need an ingredient? Downstairs is a small market on first level which has most basic foods besides sundries and souvenirs. Want to hit the beach? Surfing, Swimming, Snorkling, and Sunbathing just walk to parking level and the ramp out to sand, sunshine, lagoon and ocean waves. Saturdays are movie night on the Kuhio Beach. Just walk south on the beach or catch Da Bus. Fishing is right there at marina or walk further to channel. Fishing gear in forward closet-Kid stuff and Big Surf poles for Bigger Fish. Call telephone number (see numbers below). Please email for pricing and availability for accuracy. Its the best for walking along the twinkling seashore and watching the Fireworks that are held every Friday Night and some Sundays. Local Hawaiian music and Hawaiian dancers Friday and Sunday evening free of charge. Balmy nights - salt air are romantic and fabulous. It is the perfect place for you and your friends! Full bathrooms and both have showers. Waikiki is where it all begins. We are where its at. Master Bedroom, Walk to lobby to view beach and marina water. Valet Only $28.00 USD per night with nice car attendants. Dishwasher has normal cycles and simple to turn on. Oven large enough for 20 lb turkey. Cookies are favorite use. 45 X 45 Dining table expands to seat 8 when needed. This condo definitely met our needs, good location if you would like to be in the Waikiki area of Honolulu. It was easy to find and the valet service was very convenient for our rental car. Ramona was very helpful, was available by cell to answer questions and provided us with quite a bit of information about the area, restaurants, shopping and beaches. We enjoyed our vacation and hope to return again next year. Overall it was fantastic! Perfect for our family of 6. The location was perfect and Ramona was always available and helpful! The location of the property was perfect. And exactly as described. The rooms were spacious and the surprise cheesecake and water was a super sweet gesture. The complex itself had a great spot for breakfast and a delicious coffee shop open early enough for us early risers. I would highly recommend this property. The food trucks outside of the lagoon were perfect for an afternoon treat and the local flare is highlighted here. The owners were full of information, suggestions and very accessable. We are a family of 6 (2 adults, 4 kids aged 14, 12, 11 & 8). This condo was perfect for our needs. 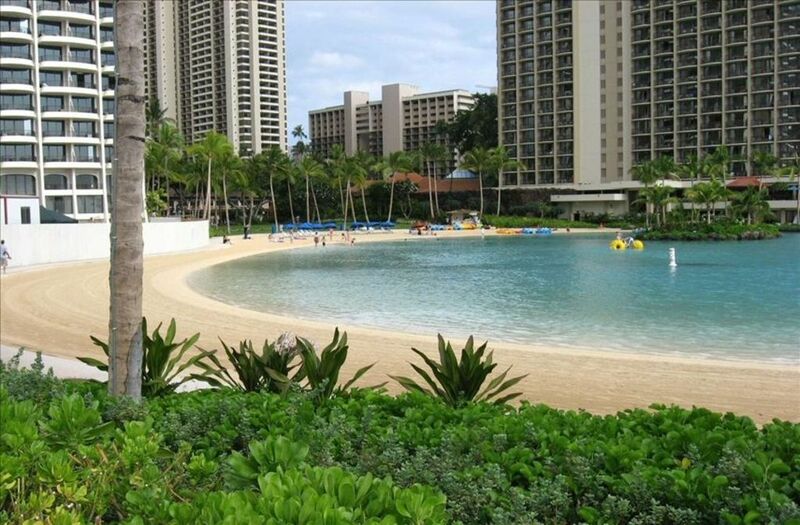 Walking distance to the beach, Hawaiian Hilton lagoon, Ala Moana shopping centre, 10 min walk to the heart of Waikiki. The perfect place to relax, nearby restaurants & pubs & you can even sit in the balcony & watch the Hawaiian Hilton infamous luau! And did I mention the Friday night fireworks. A perfect holiday in paradise. Thanks Ramona! The occasion was my parent's 50th Wedding anniversary - in their words 'Best Vacation we have ever had'. In great part because of the condo and Ramona. Ramona made a great experience exceptional by paying attention to detail and taking care of all of the little things. The literature that was provided electronically prior to the trip and the information in the condo was extremely helpful - along with her texted tips. She was very responsive. The condo is exactly as shown in the pictures, a perfect home away from home. The location is exceptional as all of the tours and public transportation picks you up right out front. Having said that, we walked almost everywhere. There are exceptional restaurants nearby Goofy's Café and the Coffee House, The mall is a short walk away. We surfed, paddle boarded and hung out on the beach 3-4 days. Enjoyed the fireworks. Best restaurant was Allan Wong's - Duke's and House Without a Key. Lappert's Ice Cream is a 5 minute walk and is exceptional. We toured the island a couple of days - Dole Plantation, North Shore and Polynesian Cultural center. We hiked Diamond Head, Manoa Falls and Lighthouse. Went to Pearl Harbor and the Chief's Luau all very accessible from where we stayed. We are the Beach known as Waikiki. Surfing competitions started here and still at held seasonally. World Class Shopping, Surfing, Beach Combing, THE Bus, Lagoon, Fishing, Boating, Location of Condo on Map is Distorted. It is right at Edge of Lagoon . Please email for specific fees and costs associated with rental. Holidays affect pricing and availability.